Mark Evans has this to say “This carvone dextro natural isolate (d-carvone) is a powerful caraway smelling top note. This natural isolate has captured the ultra-spicy, herbaceous, aromatic, rye-bread, minty aroma with more realism and naturalness than the synthetically produced version ever could. Carvone has two isomers, which are molecules that are optical mirror images of each other. If you separate the isomers from each other, one (laevo-carvone) smells and tastes of spearmint and the other (dextro-carvone) smells and tastes of caraway seed. Amazing when you think about it. 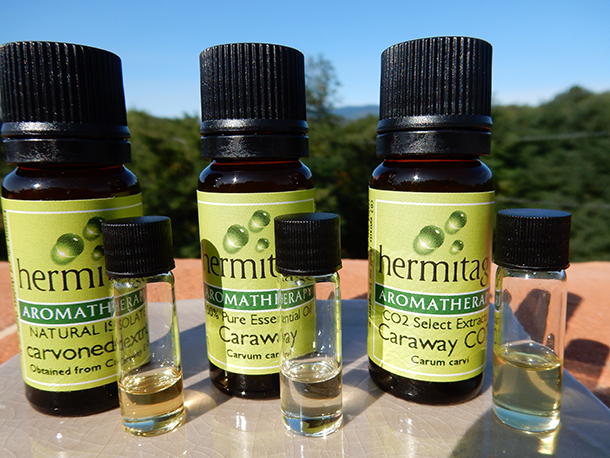 We now also carry caraway CO2 and caraway essential oil. Extracted from caraway essential oil.